As we were getting low on bread I decided to walk to Waltham Cross. 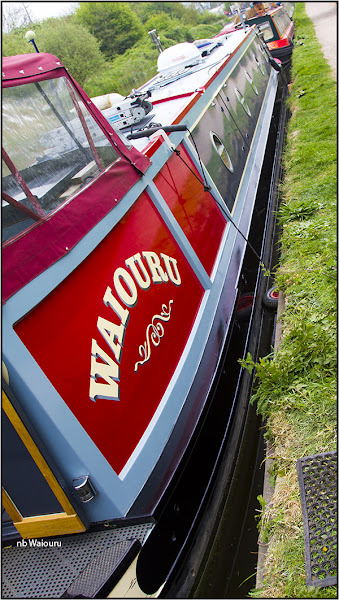 It’s on the opposite side of the Lee Navigation to Waltham Abbey which we plan to visit tomorrow. 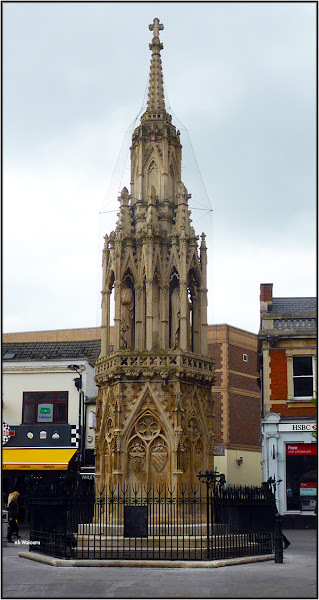 The major reason for deciding on Waltham Cross is because this is where one of the last three Eleanor Crosses can be seen. There were originally 12 crosses on the route between Lincoln and Westminster Abbey. Eleanor of Castile was the wife of Edward I (Hammer of the Scots) and when she died at Lincoln in 1290 Waltham Cross was one of the overnight resting places for the coffin. King Edward subsequently commissioned the erection of a cross at each of the resting places. I was expecting to see a simple medieval stone cross. This is far more ornate and doesn’t appear to have aged sufficiently to be almost 800 years old. The plaque on the surrounding cast iron fence gives a brief history and mentions the original stone carvings from the cross are in the Cheshunt museum. The information in Wikipedia advises the cross has been restored a number of times and the original statues were moved to the Victoria and Albert Museum in the 1980’s. Waltham Cross High Street appears to be dying with many of the shops either vacant or boarded up. We have an important day coming shortly and I was on the hunt for a birthday present. Something small (room is tight on the boat) but useful. Eventually I found what I was looking for. No doubt Jan will be pleased with her present. 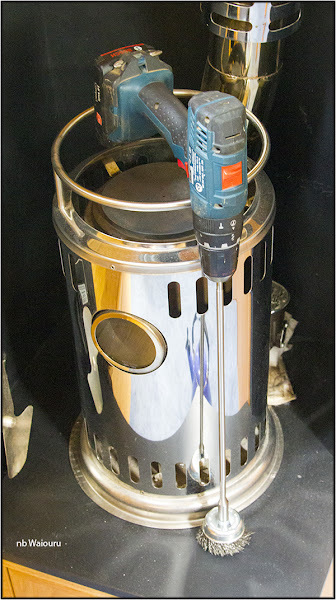 Yes readers, it is an extension for the portable electric drill. One end fits into the drill and on the other end I have fitted a round wire brush. I think Jan will find cleaning the burning chamber of the Refleks stove much easier using this. Of course I’m not going to let her use it until she has recovered from her current bout of bronchitis. I don’t want the soot and dust adversely affecting her recovery. In the afternoon yesterday’s primer coat on the starboard gunwale was sanded back and a glass black topcoat applied. That’s almost the last of the Craftmaster black gloss used and the port side has yet to be done. The finish looks much better in the ‘doctored’ photo! Duh… I should have thought of that!